Optherium's Serge Beck shares details about the project's development, future and the general way forward for the industry. With many blockchain solutions competing for attention, Optherium Labs stands out due to its modular ecosystem built on a MultiDecentralized Private Blockchains Network. Optherium is a blockchain-as-a service provider for Fortune 500 enterprises. Optherium also caters to individual users with the VivusPay app, which allows instant global fiat and crypto transactions. Optherium is not afraid to assert that is the new standard for global financial blockchain infrastructure and has backed it up with serious investment. Optherium has already ploughed $3 million into product development. The CEO of Optherium, Serge Beck, was able to take some time out of his busy schedule to answer our questions regarding the Optherium Ecosystem’s development, key features and what is in the cards for the near future. CV: Serge, I understand your background is as a computer programmer, building and implementing applications on Wall Street. How were you introduced to the world of blockchain? SB: Yes, I was a programmer in 2000’s corporate America, a very interesting time where I was able to pick up new skills working for some of the big investment banks, including Bear Stearns, HSBC and Merrill Lynch. Many differents aspects of blockchain technology are not new. 20 to 30 years ago we were doing triggers on the backend, which are now called smart contracts. Mirroring a database among different servers is essentially the ledger system. We were working with encryption ...These ideas and processes have been around for a long time, but people now have a greater understanding of what blockchain solutions can provide, with services that are much easier to access, for example on a smartphone. CV: What made you decide to dive even deeper into this area and develop a blockchain-based product? SB: I saw a need. It’s as simple as that. With blockchain technology you can solve the problems of data security, speed of transactions and limited usability for cryptocurrencies. In this increasingly globalised world, financial institutions know that things can be done in a better and more efficient way, but it is extremely costly and difficult to change infrastructure. Our aim is to give companies a fully formed product that they can migrate to, with minimal risk and hassle. CV: So this is why financial institutions still use centralised data storage? SB: Yes, there is no solution like Oracle for decentralized storage on the market yet. This we want to change. CV: Your operations are based in Zug, why is this a great place to develop your product? SB: Zug is the heart of the CryptoValley Association. It is full of well known developers and start ups, like Shapeshift and Bancor. It’s a community where everyone has a lot of energy, enthusiasm and we all keep an eye on what everyone else is doing. It breeds this healthy competition, but people are really friendly and help each other out a lot too. CV: How did you come up with the idea of the MultiDecentralized Private Blockchains Network (MDPBN)? SB: My business partner and CTO Roman Kaganov and I were trying to solve the problem of scalability. We made projections for when blockchain is adopted more widely and were shocked that just 100 million people making 4 or 5 transactions a day the current rates of 5,000 to 6,000 transactions per second could easily clog up the existing infrastructure so badly that transactions time would plummet and fees would skyrocket. We split different functionalities across the blockchain networks, and then scaled those blockchain networks horizontally and were very pleased with the results. Among other things, a MDPBN allows for separating private data from other information, archiving old data using a merkle tree if it’s not needed anymore, and improving latency time. By putting blockchain nodes near each other in one region, country, or even city, we can archive block consensus very quickly. CV: Along with your MDPBN, another flagship feature of the Optherium Ecosystem is the Key Recovery Service (KRS). How is decentralized data storage compatible with the retrieval of private keys for users? SB: Obviously we need a centralized place to store private keys, but it is done using cold storage. Replicas are kept on multiple air gapped computers. From the storage side it is incredibly safe, but of course the other factor is who can retrieve this private key. Our MultiSecure Technology is designed to protect users’ data through multiple factors of verification. At the core of this is our Dynamic Biometrics service. CV: That was where I wanted to go next. How exactly does your trademarked Dynamic Biometrics system work and what are some of the hurdles you need to overcome? SB: Dynamic Biometrics uses voice, fingerprint, retina and also facial movement, this is the “dynamic” part. Biometrics is not a new idea, and although safe, can still be bypassed, as seen with the hacking of retinal scans. Dynamic Biometrics however, is completely safe, for the simple reason that it doesn’t just capture your features but also the rhythm of your idiosyncratic movements, which can’t be forged. 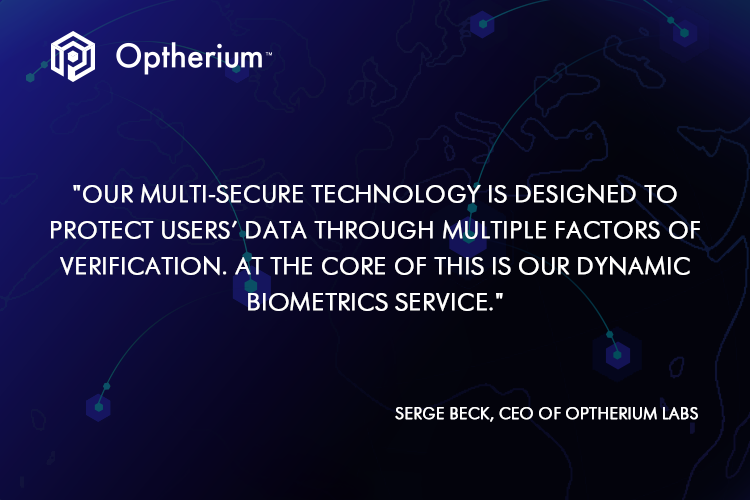 In Optherium’s Ecosystem, the user will be able to upload their biometric template which can be used across all of our services. This is the next generation of biometric identification. A big hurdle to overcome is the storage of biometric data, which although extremely difficult to replicate, is stored by companies in centralized locations, either on a server or a device. On a server, the data can be hacked, on a device it can be lost. Optherium Labs’ research focus is in an area of Biometric Encryption, untraceable and cancelable Biometrics. We are looking at how decentralized blockchain technology can keep it more secure than anything that has come before. Our goal is to make each person their own private key. CV: Digital payments are growing at a very large rate and people are accepting that cryptocurrencies aren’t going anywhere. What concrete improvements is Optherium going to bring to this sphere in comparison to all the other solutions on the market? SB: Well, like we were talking about before, security is a big one. Of course there is also speed. With our app VivusPay, you can make global crypto-to-fiat and fiat-to-crypto transactions instantly. As everything goes through our Ecosystem we can offer drastically lower fees compared to traditional payments that need to go through, and get permission from, third parties. At the moment we can do over 100,000 transactions per second, compared to Ripple for example, which can handle 1,500. As we grow in users we will able to go even faster. CV: Cryptocurrencies have been around for ten years, why have banks been dragging their heels when it comes to adopting them, and are they finally taking cryptocurrencies seriously? SB: I think banks have taken them seriously for a long time, but due to the volatility and regulatory issues they have been cautious in adopting them. The biggest barrier, I believe, is the fact that supporting them requires new infrastructure. Global finance knows that they need to make the move sometime soon, which is why we will be there to offer them an Ecosystem that they can customise for their own needs and the needs of their customers. CV: For the Optherium Ecosystem to seamlessly convert between different crypto and fiat currencies, it utilises its own exchange and the OPEX token. Can you expand on the role of this token? SB: This is a complex question because it involves a lot of internal processes, but I will try to answer it briefly. Yes, the OPEX token works as a guarantor, covering transactions that are made within the Ecosystem. It’s the bridge between crypto and fiat. It also serves as proof of node licensure, giving investors access to our 25% “dividend” distribution program. CV: How are you raising money for your project? SB: Well we have already passed our angel and seed rounds and we are now onto Round A of fundraising. We have been hard at work for over a year now, and our upcoming Whitelist Sale in October will allow us to continue our rapid pace of development. Here, an investor can buy OPEX tokens at a heavily discounted rate or explore node licensure. You can get more information on our website. CV: Is there anything else exciting on the horizon for Optherium that you can disclose? SB: A couple of things actually. We inked a deal with CoinBene a few months ago, who will list our OPEX token and promote our VivusPay app as a safe, fast and usable mobile eWallet. We are really excited about this as they have over one million users. We are also introducing the Optherium debit card; we are getting multiple bank licenses for different countries. With VivusPay, it will give people the ability to transfer crypto-to-fiat and withdraw from any ATM in the world! We have complete faith in changing the entire financial sphere and that’s what excites and motivates us.